Ever have a moment of acute designer covetousness that coincides with the realization that you have, like, $67.16 to last you through your next paycheck? The things we see on the runway and in magazines might as well for most of us exist in another universe. But if you consume designer collections more with your mind's eye than with your wallet, and you have some basic crafting skills, making your own at-home versions isn't always too hard. Last week, I took an idea Prada had — making handbags out of knitted leather — and translated it into a purse of my own. If you can knit, you can knit this bag. You'll need everything you see here for this project. Clockwise from top left: 1. A pair of knitting needles (I used size 8). 2. An awl. 3. PVA or wood glue, or other glue suitable for gluing leather. 4. A knitter's kilt pin. 5. A seam-ripper. 6. Sewing scissors. 7. Crewel or embroidery needles, plus a knitter's blunt-tipped tapestry needle, and thread. 8. Either a purse frame, or an existing clutch purse in a color that approximately matches your leather. 9. Leather! You'll need about 50 yards of thin, wide leather strips, depending on the size of the bag you're working from, obviously. I used a combination of Tandy Leather Factory Velvet Suede Lace and 7mm-wide strips I cut from an old black leather skirt I've been cannibalizing for craft projects for years. The Velvet Suede Lace is thin and durable enough to knit with, and it is available from Michael's stores and online. Click any photo in this tutorial to enlarge. My inspiration for this project was the group of knitted leather handbags Prada showed with its fall-winter 2010 collection. 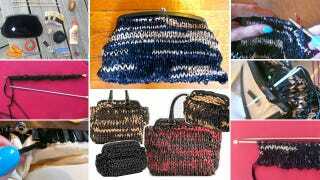 Something about the chunky-knit texture of the purses, and the way a common handbag material — leather — was given an unusual treatment — knitting — just made my mind race with possibilities. In real life, those purses started at $2600. But inspiration is free. While I'm against the counterfeiting of designer goods and all the misery, human-trafficking, and organized crime etc. it tends to fund, I can't see anything wrong with a home sewer seeing a designer's fabric treatment, color combination, or silhouette, and offering his or her own non-commercial kind of take. First, knit a gauge swatch. It'll help you to get used to knitting with leather, and it will allow you to determine how many stitches and how many rows you will need to cover your "base" purse. What we are going to do, essentially, is create a knitted sack that will wrap like a façade around a plain clutch bag; then we'll attach the façade to the bag with whip-stitching around the purse frame at the top. I nabbed this plain, black, leather-trimmed Banana Republic purse at Goodwill for $5.99. If you are more ambitious, you could also knit a bag, sew a lining, and attach the two to a metal purse frame with much the same whip-stitching. One fantastic online resource for bag making in general is Lisa Lam's blog U-Handbag. I've read her site for years. The materials she sells are decently priced and high-quality, her tutorials rock, and she posts lots of reader submissions, too. Lam even put up a photo of the first, second, and third bags I ever made, way back in 2007. I gave the black one to my mum, the tan and snakeskin I still have, and the cream leather envelope clutch I actually gave to onetime Jezebel commenter SkinnyBoneJones for her birthday when I lived in San Francisco. I miss that town, man. When you've determined the number of stitches you'll need to cover one side of your "base" purse, cast on double that number of stitches using your preferred casting method. Now, knit the bag. In order to avoid having to knit a front and a back, and sew them together at sides and bottom, we're going to made one double-sided tube. This kind of flat, double-sided knitting is easy: when starting your first row, knit the first stitch, then pass the yarn to the front, and slip the second stitch onto the receiving needle. Then pass the yarn to the back, and knit the third stitch. Pass yarn to the front, slip the next stitch, pass to the back, knit the next stitch. In this manner, we will knit every other stitch down the first side, and then we will then turn around and on our way back knit all the stitches we skipped, passing the yarn in front of each of the stitches we just knit on the front. Simpler: Knit every other stitch on the way there, and then every other stitch on the way back. This is essentially like knitting on a circular needle. And, like like on a circular needle, you never have to purl. (If you're more comfortable on a circular needle, or double-pointed needles, you could use those instead.) As you work, make sure to remember which side is your front and which side is your back, so you end up with an even number of rows at the end. If you are switching colors periodically, it won't be too hard to differentiate between the front and back because the pattern of color distribution will be different. If you're using one color, consider using a stitch marker. If you're making a multi-colored bag — I'm mixing black, tan, and light brown — or whenever else you need to splice in a new piece of yarn, do it by overlapping the two pieces of leather yarn by a half an inch, taking your crewel needle and thread, and sewing a few running stitches at the join. Be careful to knit fairly loosely, because leather doesn't stretch like most yarns, and it can break. And watch out for the dye — it will start to rub off on your fingers. With a podcast on the stereo (I love Julie Klausner's) and a liquor drink to sip at the end of every row, I could seriously spend hours at this. When you've finished the number of rows it will take to cover your "base" purse up to the frame, begin casting off. This will take the two knitting needles, plus the kilt needle. First, knit the first stitch of the front of the bag and pass it onto the receiving needle. Then slip the second stitch — which, remember, because of our nifty front-and-back-in-one method is actually the last stitch of the back of the bag — onto the kilt pin. Close the kilt pin. Then, knit the next stitch on the front side. Keep your cast-off stitches loose. When you have two knit stitches on the receiving needle, slip the first over the second, and let it drop. You now have one stitch left on the receiving needle. Repeat what you did before: slip the next back stitch onto the kilt pin, close it, and loosely knit the next stitch. Slip, and drop. Repeat all the way around. When you have finished casting off on the front side of the bag, turn your work around, and cast off in the same manner, using the kilt pin as your source needle. Note: This just happens to be my preferred method of casting off. If you have a better one, or one you're more comfortable with, use that cast-off instead. Just be sure to slip every back stitch onto a kilt pin or other stitch holder as you make your way across the front. Now, using the blunt tapestry needle, open up the bag and work your yarn tails into the wrong side. Slip your new knitted bag-façade over the actual bag (or over the lining you've sewn, if you're going the make-your-own-bag-from-scratch route). Pin in place at center front, center back, corners, and at the ends of the purse frame (which are not visible in this photo). Using your awl, and working carefully (remember Louis Braille! ), punch holes through the lining of your "base" bag, right next to the frame. Thread the blunt-tipped tapestry needle with a length of leather and pull it through the first hole, leaving about a 1" tail. Use a dab of glue to secure the tail to the inside of the purse frame. Then wrap your leather around the frame, and pull it through the next awl hole. With every whip-stitch, make sure to catch your casting-off stitches with the needle. In this way, you will attach the knitted bag to the purse frame, and cover the purse frame with an attractive row of leather whip-stitches. Work your way along the frame. If you run out of one piece of leather, push its tail flat against the of the frame inside, start a new piece of leather, dab glue on the two leather tails, and wrap over the tails to hide them. Repeat the whip-stitching on the other side of the bag. Remove your pins as you go along. To secure the end of your line of whip-stitching, sew two back-stitches through the last awl holes, and then tie the leather in a knot. Trim the tail, but not too closely. For a final step, use the seam-ripper to remove whatever label was originally in your "base" bag. This is not Banana Republic's bag anymore, beotches. Here's our final product. I like that it doesn't look like I was trying too hard to copy Prada, cus that's lame — the width of my leather yarn, the overall shape of the clutch, and the balance of black, brown, and tan are all pretty different on my bag. I took what I liked about a new (to me) way of using leather, and made something that looks equal parts granny and tough. I can't wait to take this thing out. For next week, I'll show you how to make a necklace out of materials from the hardware store. In the meantime, to check out past Friday DIYs — including how to paint your nails with stripes, how to make a custom dress form parts I and II, how to make a fascinator, how to alter a thrift-store dress, and how to make a pair of shorts — click here.